Eight million tons of plastic end up in the world’s oceans every year. The gravity of our plastic problem has now been felt and acknowledged by many countries globally, and people are starting to take serious action. From finding alternative and dare I say more productive ways to “throw” waste (by stuffing them into plastic bottles to form eco-bricks), to banning the use of plastic altogether, the awareness and mindfulness some people, institutions, and governments now have towards this waste problem is a glimmer of hope on the now-waste-ridden planet. That ray of hope shines a little brighter still, now that the world’s first plastic-free supermarket aisle exists. 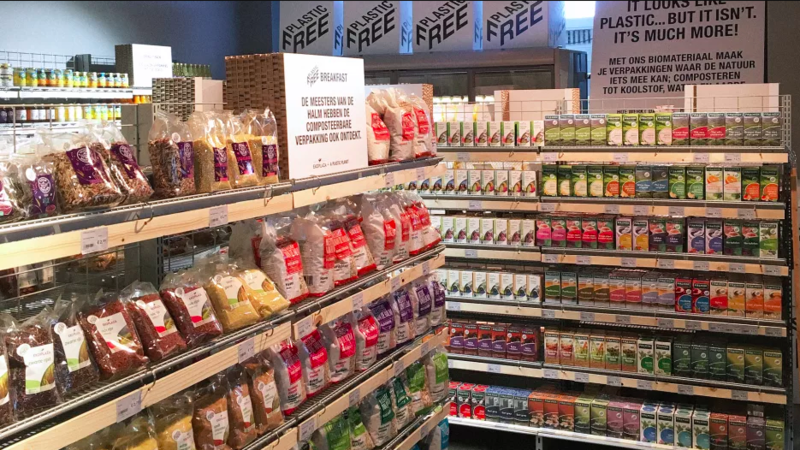 Ekoplaza, a supermarket in Amsterdam in the Netherlands debuted the plastic-free aisle last Feb. 28. The aisle has a selection of around 700 products, ranging from meat and produce to drinks and even snacks, all in plastic-free packages. The groceries are packed using “new compostable bio-materials” (in the case of the items that still look like they’re wrapped in plastic), as well as more traditional non-plastic materials like glass, metal, and cardboard. While there are already a number of zero-waste grocery stores in other countries (and even in the Philippines, some stores allow customers to buy with their own containers), most of these are still small-scale sellers. Ekoplaza is the first grocery chain to adapt going plastic-free at this scale. The campaign for the plastic-free aisle was created by the group A Plastic Planet. In an article by The Guardian, A Plastic Planet co-founder Sian Sutherland says of the movement: “The is absolutely no logic in wrapping something as fleeting as food in something as indestructible as plastic. Plastic food and drink packaging remains useful for a matter of days yet remains a destructive presence on the earth for centuries afterwards.” Well-said. Ultimately though, the responsibility of reducing waste falls on everyone’s shoulders. Shifting to a more sustainable lifestyle requires changing our consumption culture. It also requires government regulation, proper and strict environmental law implementation and enforcement, and cooperation between governments, institutions, manufacturers, corporations, and of course, the public who buys and uses the products. But this plastic-free aisle is a step towards shaking up the collective consciousness when it comes to the way we consume. And frankly, I think that’s already a small victory in itself.